Making French friends, enjoying the sea and some French freedom! Yet another lovely, action-packed day in sunny Hardelot! We started our day in the Le Touquet market where the children purchased a dazzling array of trinkets (and perhaps a few French sweets…). We then came back to the centre for a delicious picnic lunch in the sun before heading to meet our penpals at the Condette school. There were wonderful cross-cultural conversations, lovely songs and some very fun games. Next stop: the beach! We were able to enjoy the glorious sunshine with some paddling, sandcastles and beach games. The children loved being by the sea and freezing their toes in the water. We returned home sun-kissed and happy for another delicious three-course meal and some play in the woods. The children are now sound asleep after another brilliant day. They can’t wait to tell their families about their adventures tomorrow. Posted in Celebrating Learning, French Trip, Year 5 & 6Leave a comment on Making French friends, enjoying the sea and some French freedom! 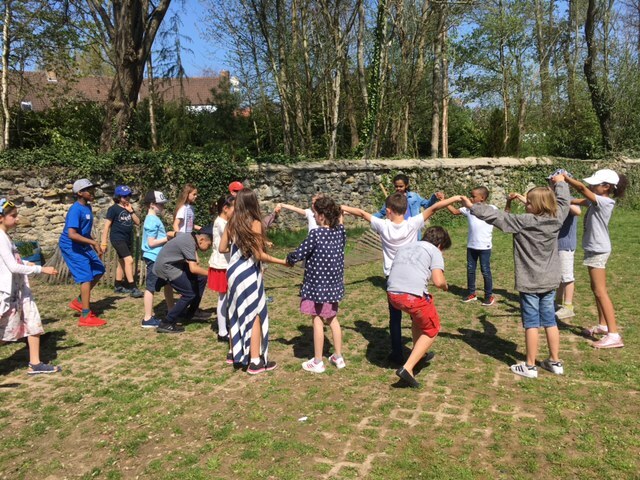 Corn dollies, bread making and French conversation – the first day for Year 5s in France. What a fun and a sunny first day we’ve had in France! After a heroically early start, we plunged beneath the Channel with great excitement. Before we knew it, we were in belle France. Our first stop was a wheat farm where we made delicious bread and learnt to weave corn in the traditional way. We had a fabulous crepe lunch (savoury for the main and sweet for dessert!) and enjoyed the fabulous sunshine. After that, we settled into the Hardelot Centre. This involved the children making their own beds – quite a feat for some! This was followed by a wonderful three-course dinner before playtime in the woods. The children are now listening to a riveting Mr Huxley story time and will be heading to bed shortly. 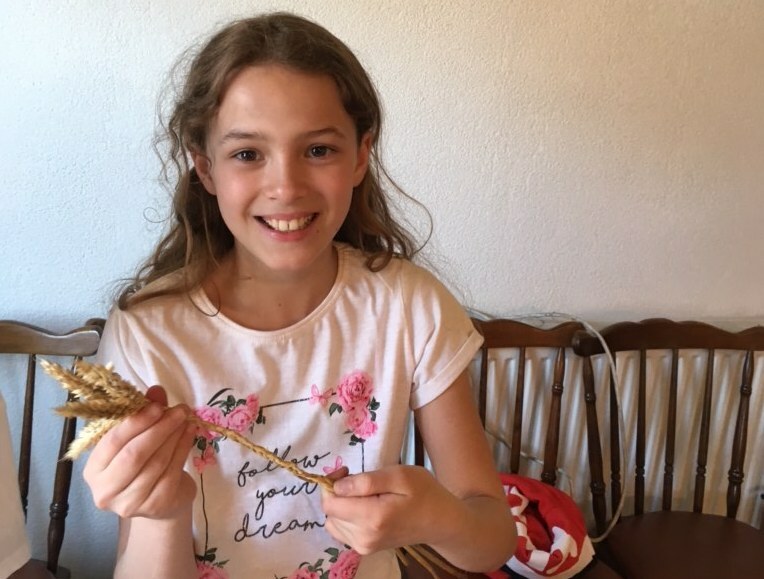 Posted in Celebrating Learning, French Trip, Global Links, Year 5 & 61 Comment on Corn dollies, bread making and French conversation – the first day for Year 5s in France. UPDATED: The Third and Final Day in France! For our last day, the children were extremely efficient and rapidly stripped their beds and packed their suitcases in order to have more time to play in the forest after breakfast. The exploration of the woods was the highlight of the day for many children! We had a lovely breakfast once again. This time, the special was pain au chocolat! We then set off to visit ‘Le chateau d’Hardelot’) the Hardelot castle and its grounds which were beautiful). The children were very interested to learn more about the complex relationships between France and England over the years, which were represented throughout the castle. Everyone also hugely enjoyed walking around the lake, spotting all kinds of fauna: we saw and heard A LOT of frogs! All of this under the beautiful sun. We got back on the coach heading towards Boulogne-sur-Mer for our picnic and treasure hunt in the fortified city. We ended the afternoon brilliantly with ice creams! Our super driver, Dave, managed to get us on an earlier shuttle and we even made back to school early! Ayomikun for eating a whole chicken at the market and still eating his lunch after that! Heba for being a great person to take on a trip, lovely and helpful at all times! Jibriel for enthusiastically building a trench on the beach! Lovera for being so positive and mature, especially at dinner times! Zack for using his French skills and making French friends! Lucas for being very helpful and lovely at all times and for great balance in the show! Oliver for making new friends in Year 5! Giulia for trying hard to speak as much French as possible! Fantastic effort! Joseph M for persevering with the weaving! Elisha for being a great friend! Malachai for taking great care at his bread making! Lola for great sharing with her friends! Joseph S for using his French at the post office and organizing a football match! Kehinde for great participation in the play! Chloe for making such an effort with your penpal! Ruby for great generosity at the market with her friends! Ayomide for embracing the market culture! Theo for superb manners at all times! Phoenix for being so helpful! Ashwin for beautiful manners at all times and great racing skills! Leonie for making lots of French friends and being so enthusiastic about everything! Rocco for showing great interest in anything related to the World War (our topic at the moment in year 5)! Taiwo for moving past her fear and enjoying time at the beach! Ajay for being so lovely and helpful, especially at dinner times! Zahra for being brilliant at answering questions and volunteering! Naliyah for confidently performing the splits for our play! Amina for brilliant bread creation! Elizabeth for kindness and showing great interest in all activities! Johanna for being so enthusiastic at all times and fantastic weaving! Mr Windle for such an engrossing and enjoyable bed time reading! Miss Jacobs for being such a fabulous photographer an entertainer at all times! Miss Lucile for such brilliant organisation, time keeping and leadership! Mrs Mckay for making sure Dave the driver was fed and watered at all times! Posted in French TripLeave a comment on UPDATED: The Third and Final Day in France! UPDATED: It’s Hardelot to Believe We’re Here! What a fun and sunny first day we’ve had in France! After an early start we plunged beneath La Manche, to great excitement – some children even believed they say whales and other sea faring animals through the tunnel walls – then took a turn around the cliff tops. It was a beautiful day and we were overjoyed to be able to clearly see our homeland across the waves. We had our lunch whilst looking back at the white cliffs. We then paid a visit to our penpals in their school. The Children were incredibly excited to be able to finally put a faces to names, and they spent a couple of linguistically challenging hours playing together and discussing school life. Finally, we settled into the Hardelot Centre and had a wonderful 3 course dinner before a bit of playtime amongst the bluebells. After everyone had got ready for bed, the children were lucky enough to listen to 3 chapters of War Horse read by Mr. Windle. The children are now fast asleep and will be full of energy for the busy day tomorrow. Posted in French Trip1 Comment on UPDATED: It’s Hardelot to Believe We’re Here!